Foreword by Walter Wangerin, Jr. Preparation (Optional): You can bring a picture of Jesus as the Shepherd or point out a picture in the church. Show your illustration after asking the children if they know who the Good Shepherd is. Pick your volunteer “wolf” out ahead of time. Who is the Good Shepherd? Can anyone tell me? (Let children respond.) Yes, Jesus is the Good Shepherd. (You may show your illustration here.) In the Gospel lesson read today, Jesus says, “I am the gate for the sheep” (John 10:7 NLT). So besides being a shepherd, Jesus is the door. Did you know that in Bible times, a couple thousand years ago, being a door was part of a shepherd’s job? 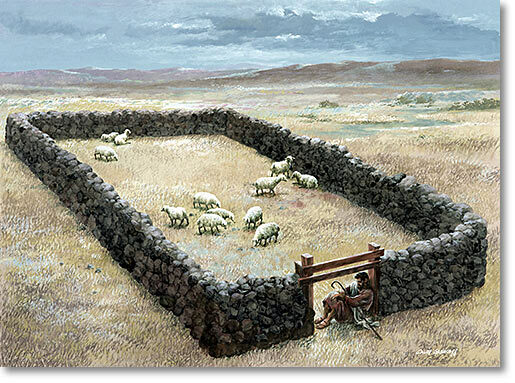 The sheep pen was usually a stone wall built in a circle with only one opening. So after the shepherd had gathered all the sheep into the pen for the night, he would have to lie down across the opening to guard the sheep. The only way a wolf could get in was through that door, so the wolf would have to deal with the shepherd first. Do you think a good shepherd would let a wolf through that door? No sir! The shepherd would drive the wolf away! Let’s see if we can build a sheep pen here at the front of the church. I need some volunteers to be part of the wall. (Choose some kids and help to arrange them.) You stones sit here along the altar rail and don’t move. You’re part of the wall. We’ll pretend that the wall goes all along the altar rail, so a wolf can’t get in that way. We’ll leave an opening here for the doorway. Thank you, shepherd, for protecting the sheep. We can be thankful that Jesus is our Good Shepherd and that he always watches over us. We remember that Jesus gave up his own life to save us from sin and death. Prayer: Dear Jesus, you are the Good Shepherd. Thank you for keeping us in your care. Enter your email address to subscribe to Kidsermons and receive notifications of new posts by email.